Did you know you can hire me? I can make your next web application whether it be a complex database driven system, or a simple static Web Site. From setting up web hosting, your personal web address, DNS management, Email through to database set-up, backup, storage - delivering your complete web application - I will find a solution. So if you need fast, friendly, valid and functioning service - get in touch. A browser check (by a php function found here) is done when landing on the homepage - if you do not have a GET variable called nomobile set and you are listed as a mobile browser then you are forwarded to m.dylanjones.info where you are presented with a simple overview of most things on the main site. My latest little web application (doesn't actually really do anything yet) now finds out, as close as possible, where you are! Notice the location parameter, now a default result in the user information call. 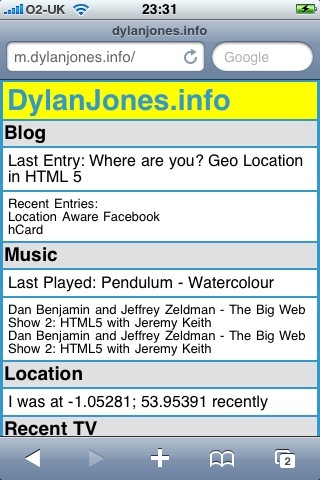 dyl.anjon.es now contains a valid hCard so you now know who I am, if you didn't before!